The 5 Regions. Scotland, Ireland, Kentucky, Tennessee, and Canada. What are these, one may ask. These are the whiskey regions of the world! Whether it's Bourbon from Kentucky or Single Malt from Scotland, whiskey is popular worldwide! Whiskey being stored in barrels is iconic. 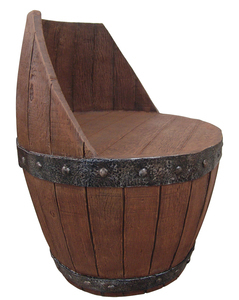 But what about whiskey barrel furniture? Even better! With our whiskey barrel chair the iconic look and exquisite details of whiskey barrels are made into a useable chair. Except ours are made of durable polyresin to make them tough!